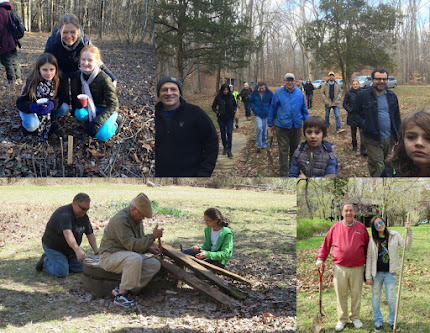 In recent years, the Friends of Herrontown Woods has teamed up with local tree experts to bring back a little known and seldom seen native tree called the butternut. Also called the white walnut, its numbers have dwindled over the past fifty years due to an introduced fungus that causes canker. Just a few persist in Princeton, discovered by Bill Sachs and arborist Bob Wells. This young butternut was grown by Bill Sachs from locally collected nuts, and planted by FOHW members in a clearing near Veblen House. Another year or two and the tree will be tall enough to survive without protection. When Bob Wells found a butternut growing near Stone Hill Church, a neighbor of Herrontown Woods, FOHW got permission to plant a couple young butternuts near it, to provide cross fertilization. Those saplings, too, would not survive without followup, and the followup probably wouldn't happen if this wasn't a labor of love, which makes one think to take a look and see how they're doing. Leaves eaten but stem still alive.